In the years I have been a pastor, writes Rick Warren, the number-one question Im asked is, Rick, why cant I change? People want to changebut theyre stuck. Do you want to get unstuck? Heres how. Drawing simple but powerful truths from the Bible, this book gives you practical guidance for specific types of change, and it links you up with the power to actually make the changes you long to make. As you apply the truth of Gods Word by the power of his Spirit, your life will change. Youll move out of your rutand get on track with Gods wonderful purposes for your life. 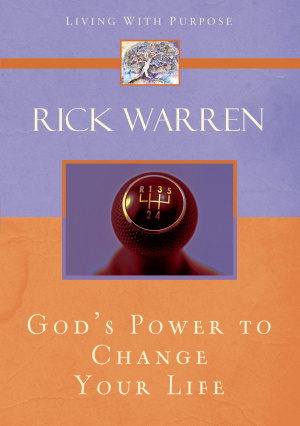 God's Power To Change Your Life by Rick Warren was published by Zondervan in September 2006 and is our 16681st best seller. The ISBN for God's Power To Change Your Life is 9780310273929. Covering similar ground to The Purpose Driven Life Warren uses this book to look from another angle. That is that people want to change but don’t know how to. Warren’s popularity must be in the accessibility of the writing as well as the boldness to offer challenges and he doesn’t disappoint in this instalment. There is practical advice for everyone stuck in a rut, from encouragement to become more loyal to friends to accepting God’s forgiveness. Covering similar ground to The Purpose Driven Life Warren uses this book to look from another angle. That is that people want to change but don�t know how to. Warren�s popularity must be in the accessibility of the writing as well as the boldness to offer challenges and he doesn�t disappoint in this instalment. There is practical advice for everyone stuck in a rut, from encouragement to become more loyal to friends to accepting God�s forgiveness. Got a question? No problem! Just click here to ask us about God's Power To Change Your Life.